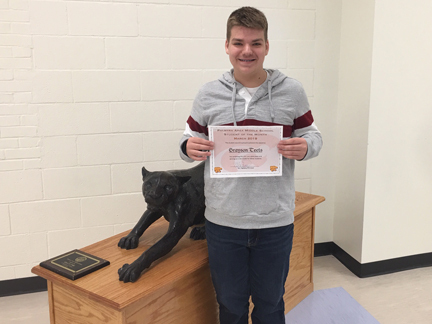 Congratulations to Grayson Teets on being selected as Palmyra Middle School’s March Student of the Month! Grayson was selected by middle school teachers as an outstanding student who consistently exhibits P.R.I.D.E. and serves as a role model for his peers. Criteria for selection included scholarship, leadership, participation in extracurricular activities, and service to school and the community. The Student Council will present this award monthly to an exceptional 8th grade student who represents Palmyra with distinction!